One really awesome thing I've embarked upon recently is a rewatch of Star Trek: DS9, aka my favorite Star Trek series, one that is incredibly close to my heart. I first watched it about ten years ago, but have wanted to watch it again in its entirety ever since. Now that I've gone and changed basically everything about the way I live my life, it seems like as good a time as ever to start again. 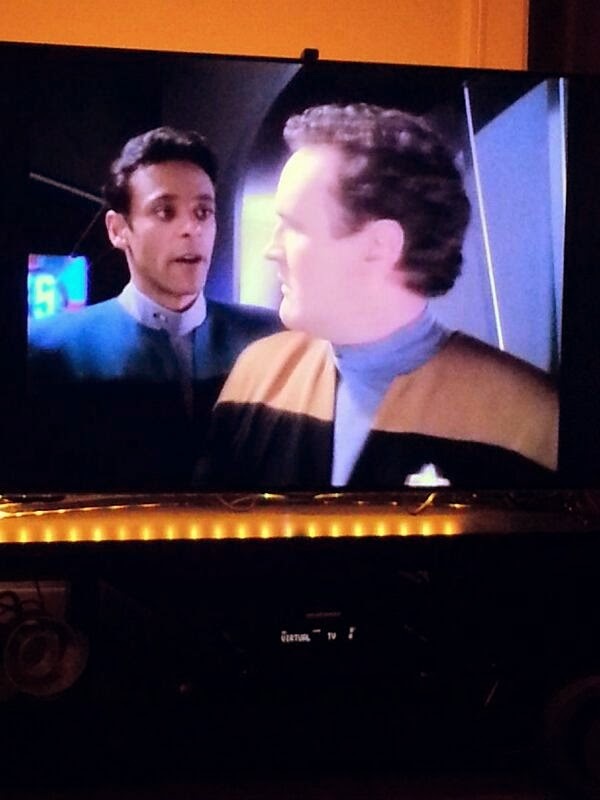 So, a few weeks ago, I began my long-awaited Deep Space Nine rewatch. It took me a little while, after finishing watching Voyager again so recently (there's always an adjustment period to a new cast), but it's become so apparent to me, after just a season, why DS9 stands above every other Star Trek series. It's such a serious, intense television show. Things aren't always OK at the end of an episode. Or a season. Or the entire series. It gets dark. Don't get me wrong, there's a lot of the good, ideal-world stuff that Star Trek is famous for, along with funny jokes, but unlike TNG or Voyager, DS9 isn't afraid to race through dark places, show you the dark side of a character or a decision or a set of decisions, and let that darkness play out over a period of time. Star Trek isn't all positive here, and I love that. I need something in between the "it's always OK!" of TNG and the "I cry during and after every episode" of Battlestar Galactica. 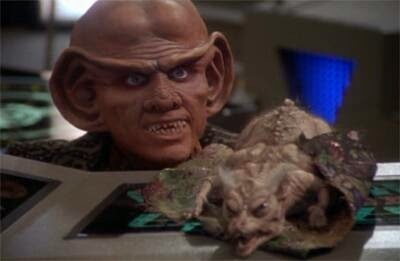 seven seasons -- the same as Voyager -- yet the character development on DS9 blows Voyager away. And while the cast may not be filled with Shakespearean Theater-caliber acting talent (I'm looking at you, Patrick Stewart and Brent Spiner), it's got some truly fantastic actors, among them the great Rene Auberjonois and Andrew Robinson. And when my favorites have a scene -- or an episode -- together? It's magic. These characters feel like family. And I love feeling everything as they go through their lives on this space station. I feel so happy and lucky to get to live these adventures again, a decade after the first time. And wow, I am an enormous nerd. This post just got kind of really embarrassing, didn't it? Anyway, the point is, I really look forward to going home after a long day at work, putting on my pajamas, cracking open a beer or pouring a glass of wine, and sitting back to watch DS9 again. It's been so long. I've wanted to fall back into this universe for so many years, and now it feels almost new again. I love this show. And if you haven't watched it? You should!